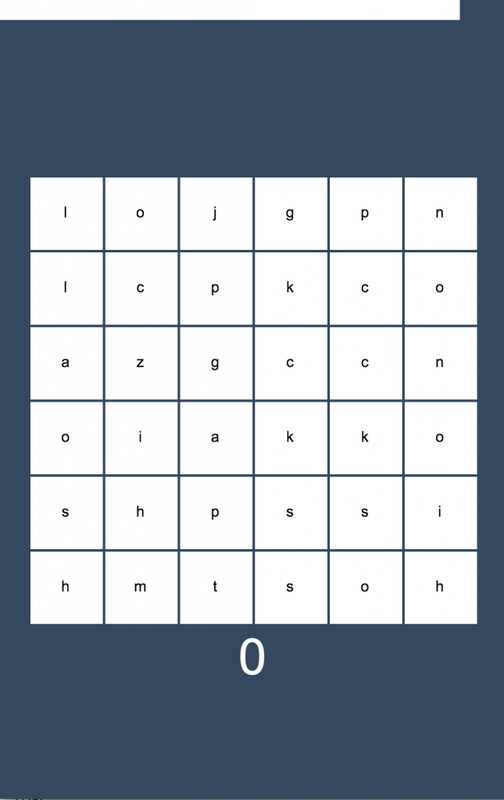 In the last tutorial we started building a word searching game in Phaser. We set up the tile grid and a dictionary so that we could check if any particular word actually exists or not (or according to the dictionary we are using at least). In this tutorial we are going to extend on that and allow the player to select a run of tiles from the grid (horizontally, vertically and diagonally) in an attempt to create a word. If they guess a word successfully it will increase their score. If you haven’t already been through Part 1 then I would highly recommend you do that tutorial first. This code builds heavily on what we did last time, so it won’t make much sense without it. You can also download the source code for both Part 1 and Part 2 separetely by entering your email address below. So you can either follow a long from Part 1 and code along with me, or just grab the completed code. The main bit of functionality we are going to create is a way to detect which tiles the player has selected. To select a word, the user will start pressing one particular tile, then they will drag along the word they are trying to create. Most of this logic will be handled in our update method. Before we add that though, there’s a bit of setting up we need to do. To toggle the guessing boolean on and off you will need to set up a listener to detect when the user taps or clicks the screen, and when they release or stop tapping the screen. Now when the user clicks or taps me.guessing will be set to true, and when they release me.guessing will be set to false. The final thing we need to set up is a “select buffer”. When a user is selecting tiles we want them to be able to select diagonally as well. If a tile is selected whenever the user hovers over any portion of the tile, then it would be nearly impossible to select diagonally without hitting the horizontal and vertical tiles as well. To get over this, we add a “buffer” that will define an area along the edges of a tile that is unselectable. When we make use of this, an area 1/8th the width of the tile along the edge of the tile will not trigger a selection. Now here’s where things get fun. The code to determine where the user is hovering on the screen, what section that translates to on the tile grid, whether it was inside or outside of the buffer and so on is quite complex (well, it’s more long than complex really). I’ve added comments directly to the code, but I will also walk through it as well. If all is well, we have a correct guess! If you launch the game in your browser now and try dragging over some words, you should see the letters you’re selecting being output to the console, and it should also tell you whether your guess was correct or incorrect when you let go. Games like this would be pretty boring if there was no scoring system. We could build a pretty complex scoring system for this, where certain letters will give certain points, and maybe we could throw some bonus tiles into the mix. But for now, we are just going to create a basic scoring system. The reason we have a scoreBuffer is becausae rather than just adding all of the score immediately, we are going to give it an animated effect. So we will initially add score to be added to the scoreBuffer and this will quickly “drain” into the actual score. The incrementScore function handles adding to the score and updating the score label. The createScore function actually creates the score label and adds it to the screen. Now you will need to make a call from your create method to render the score label on the screen. and you will also need to handle that “draining” effect from the scoreBuffer to the score by adding some code to the update method. So now, whenever there is anything in the score buffer, the score buffer will be decreased by one and the score will be increased by one. Since this sits within the update loop it will continually be called until there is no longer any score left in the score buffer. Now all you have to do is add to the scoreBuffer whenever you want to add to the users score. The final bit of functionality we are going to add is a timer. Once this timer runs out, the game will be over. Rather than creating a typical time display, we are going to create a bar that slowly decreases as time runs out. Once again, we are going to create some new variables to keep track of this functionality. The reason we are keeping track of the fullTime as well is so that we can calulate the percentage of time left, which we will use to draw our time bar. Let’s create that time bar by creating a new function. The first function renders the time bar on the screen. We use bitmap data so that we can draw the bar, rather than using an image sprite for it. We set cropEnabled to true because we will decrease the size of the bar by cropping it. The second function handles this cropping. It creates a new rectangle based on the percentage of time that has elapsed, and then uses that to crop the original time bar. Of course we will need to make some calls to these functions, so let’s do that now. Now when the time runs out, the game will be restarted. I’ve added quite a bit of complexity to the game and I think it would be quite hard to turn it into a cohesive tutorial, but if you’re interested in any of the features I’ve added let me know and I’ll see what I can do.